About 120,000 animals are body shot each year and 1,200,000 every ten years. These animals may suffer slow and/or painful deaths. The Code stipulates that kangaroos are to be ‘brain’ shot and provides a diagram to demonstrate where the shooter should aim.1 The objective is for the kangaroo to have an instantaneous loss of consciousness and rapid death without regaining consciousness. It is generally considered that shooting a kangaroo in the brain will result in a sudden and painless death for the animal. However, although instantaneous death for the kangaroo is the objective, this is certainly not achieved in all circumstances. Both the RSPCA and Animal Liberation estimates are limited by the fact that they have only assessed carcasses at meat processors. Kangaroos that are body shot and left in the field are not included in these figures. 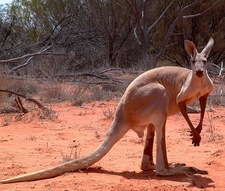 Therefore, the percentage of body shot kangaroos must be even higher. 1. Department of the Environment Water Heritage and the Arts, National Code of Practice for the Humane Shooting of Kangaroos and Wallabies for Commercial Purposes (2008) <http://www.environment.gov.au/biodiversity/trade-use/wild-harvest/kangaroo/pubs/code-of-conduct-commercial.pdf> accessed 8 October 2010, 2.4 (Point of aim) and Schedule 2. 2. RSPCA Australia, The Kangaroo Code Compliance Report: A survey of the extent of compliance with the requirements of the Code of Practice for the Humane Shooting of Kangaroos, prepared for Environment Australia, July 2002 <http://www.deh.gov.au/biodiversity/trade-use/publications/kangaroo-report/summary.html#71> accessed 8 October 2010; RSPCA Australia (1985) Incidence of Cruelty to Kangaroos. Report to the Australian National Parks and Wildlife Service. 3. RSPCA Australia, The Kangaroo Code Compliance Report: A survey of the extent of compliance with the requirements of the Code of Practice for the Humane Shooting of Kangaroos, prepared for Environment Australia, July 2002 <http://www.deh.gov.au/biodiversity/trade-use/publications/kangaroo-report/summary.html#71> accessed 8 October 2010, Summary. 4. Ben-Ami, Dror, A Shot in the Dark: A Report on Kangaroo Harvesting (Report prepared for Animal Liberation NSW, 2009), 25; Appendix 1, Video: Chapter 7. 5. Ben-Ami, Dror, A Shot in the Dark: A Report on Kangaroo Harvesting (Report prepared for Animal Liberation NSW, 2009), 25. 6. RSPCA Australia, The Kangaroo Code Compliance Report: A survey of the extent of compliance with the requirements of the Code of Practice for the Humane Shooting of Kangaroos, prepared for Environment Australia, July 2002 <http://www.deh.gov.au/biodiversity/trade-use/publications/kangaroo-report/summary.html#71> accessed 8 October 2010, Summary. 7. RSPCA Australia, The Kangaroo Code Compliance Report: A survey of the extent of compliance with the requirements of the Code of Practice for the Humane Shooting of Kangaroos, prepared for Environment Australia, July 2002 <http://www.deh.gov.au/biodiversity/trade-use/publications/kangaroo-report/summary.html#71> accessed 8 October 2010, Summary; NSW Young Lawyers Animal Rights Committee, 'A submission to the NRMMC Working Group on the National Code of Practice for the Humane Shooting of Kangaroos' (prepared by Kristen Dorman, Carolyn Wilson, Angela Radich, Katrina Sharman, Stephanie Abbott and Nigel Myers), October 2004, 15. 8. David Nicholls, ‘The Kangaroo – Falsely Maligned by Tradition’ in Maryland Wilson and David B Croft (eds), Kangaroos - Myths and Realities (2005) 33, 38.